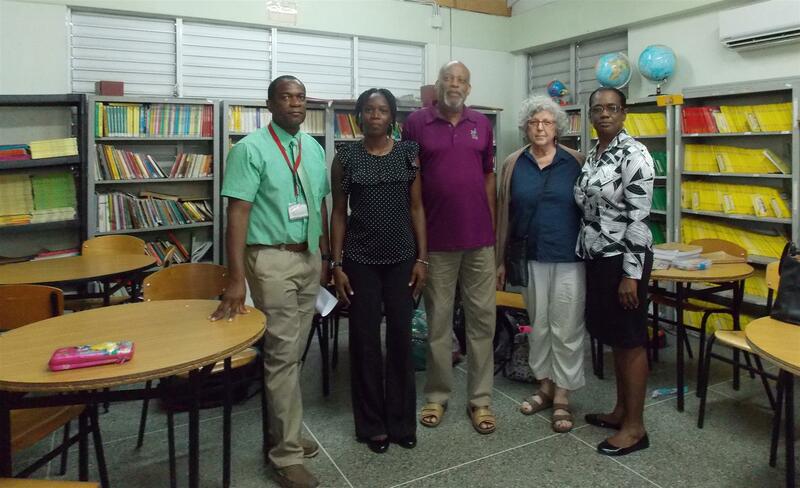 Left to right: Dr Paulson Skerritt, Lecturer in the Reading Education and Literacy Studies (School of Education, The University of the West Indies); Ms Donette Gray, Librarian, Holy Saviour Anglican School; Courtney Doldron, President, Rotary Club of Willowdale (Toronto -District 7070), Jan Siegel, President-Elect, Rotary Club of Willowdale (Toronto) and Mrs Hazel Edwards, Principal, Holy Saviour Anglican School during the recent visit to the school by the Rotary Club of Willowale - who donated hardware items for the Library and the Rotary Club of St Augustine. The School of Education at The University of the West Indies, St Augustine Campus was very thrilled to be involved in a partnership between the Rotary Club of St. Augustine (District 7030) and the Rotary Club of Willowdale, Toronto (District 7070) and Holy Saviour Anglican School initiated by final year PhD student Mr. Asif Dover. The Rotary Clubs have demonstrated a keen interest in investing resources and expertise that will make a significant impact on the reading achievement of the students at the school. The resources provided along with the implementation of other aspects of the reading programme drafted by Mr. Dover will also support the efforts of the reading specialist at the School of Education, Dr. Paulson Skerrit. He is currently building the capacity of a small diagnostic team as they work toward assessing students referred by their teachers for having reading challenges and making recommendations for addressing those challenges. The School of Education runs a number of reading courses targeting graduate students seeking to further equip themselves with the knowledge and skills that would enable them to contribute to the production of proficient readers in a range of roles. These roles include but are not limited to conducting reading assessments, delivering instruction, providing professional development and leading initiatives for school wide reading programmes. Mr. Asif Dover participated in the course titled Setting up School-based Reading Programmes. In this course, Mr. Dover first learned what constitutes an effective reading programme using a discovery approach that took him through a careful critical analysis of several reading programmes and published scholarly reviews of those programmes. He was then assigned to a school to do a needs assessment and to determine the components of a reading programme that could feasibly address specific literacy needs of the school community. The goal was to develop such a programme, provide the school personnel with the needed support to implement the programme and to the extent possible follow-thru on such an implementation. Results of a school needs assessment based on a survey of attitudes to reading, interest inventories, learning modes, processing styles, and detailing reading-related needs. A description of the clientele to be selected and served. A survey of participants in the programme – teaching assistants, parents, community volunteers etc. Goals, objectives, and priorities of the programme, as well as a description of the model and perspective on which it draws. A rationale for their choice must also be given. A plan of action highlighting programme initiatives and foci. A schedule of how instructional time will be used. It must factor in the strategies of differentiated instruction and grouping. Related professional development and staff plans, as well as community of practice initiatives. Plans for creating psychological conditions to facilitate reading improvement. A plan for evaluating students and the Reading Programme, including the communication of baselines and outcomes. Graphic representation of the Programme. Any other relevant programmme elements. Mr. Dover was given two additional weeks at the end of the semester in which he would operate within the school to fine-tune the plan and support its implementation.